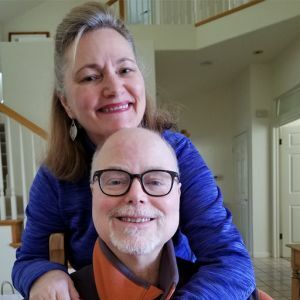 Home » Bio » Caregiver_Contest » Robert C.
In August 2018 I was diagnosed with aggressive Stage IV prostate cancer. Immediately after my shock and disbelief, I experienced rage directed at myself for having allowed this to happen. I had not gotten regular checkups and exams, despite my wife Deborah’s pleas for me to take action. And now here I was with the worst possible outcome, and it was all on me. I was in a mud hole of depression. Had anything I had ever done really mattered? Had I actually brought value to anybody, or was it all just in my own imagination? Deborah sat down with me and said that she had forgiven me, and now I needed to forgive myself. But, it wasn’t that easy. I was physically challenged and getting worse fast. And my outlook and mood remained bleak. A couple of weeks after my diagnosis, Deborah asked if it would be okay for a few friends to come over the following weekend. “Why not?”, I thought. It would be good to connect with others. To my surprise, friends came from hundreds of miles away to be at this party. And, once everybody was assembled, Deborah asked them each to tell me what I had done for them and how I had made a difference in their lives. It was an incredibly moving and intimate experience for me. And, it worked; I felt much better about myself afterward. However, Deborah and I both knew that tremendous challenges lay ahead. I had numerous diagnostic examinations. Deborah sat on the computer for hours, educating herself about my condition and all of the remedies and implications of the disease. She insisted on receiving and analyzing all of my lab work and tests, studying them with intense concentration. My ability to walk declined rapidly. I was having multiple agonizing back spasms, and the doctors placed me on increasing levels of painkillers. In a meeting with the doctors, Deborah asked them about something that they had completely overlooked: an entire section of my spine had not been examined, X-rayed, or otherwise evaluated. It lay in between the various images that had been taken. “Shouldn’t we examine this area too?”, she asked. The doctors agreed and had images taken of me. What showed up was quite horrifying: I had a tumor directly on my spine within 1 centimeter of penetrating my spinal cord. I was immediately scheduled for radiation therapy. By now, I was almost unable to walk at all, and I began experiencing excruciating neuropathy in my shoulders and arms. I was becoming a quadriplegic. During all of this, Deborah took over all household duties and responsibilities. She also managed my calendar and paid all of my bills. She helped me into bed, put a blanket over me,, lay in bed with me and held my hand. We talked quietly night after night, experiencing a deep love for each other. The radiation therapy was agonizing as it attacked the tumor on my spine. I was on high dosages of painkillers and steroids, but they didn’t do nearly enough to relieve me. My feet and ankles were swollen and looked like they belonged to an elephant. As the treatments were almost complete, it was so excruciating for me to get into the car that I felt like I just couldn’t do it. Deborah and two other friends lifted me into the car, where I shook from the horrible pain long after I was in the seat. Every bump or turn in the road was agonizing. After the therapy, my back pain began to lessen and I was able to walk with a cane. It was a miracle to me that I could walk again at all. In fact, if Deborah hadn’t pointed our the overlooked area of my spine, I likely would have lived only a few weeks longer. However, I soon noticed a new pain in my right hip, which I attributed to overworking the area. Unfortunately, my right hip became worse and worse until I could no longer walk at all. Deborah called for an ambulance, and after being transported to the local hospital, we were told that my right hip and part of my right leg had fractured. I needed an immediate hip replacement because my bones were bleeding inside of my body. The problem was that local surgeons were reluctant to perform such an operation on cancer-weakened bones. I had arrived at the hospital in the early afternoon on a Sunday, it was now close to 5 PM and we hadn’t found a suitable surgeon to perform the operation. Deborah was advised that she might need to take me to hospice if the surgery couldn’t be performed soon. One of the surgeons was an incredibly kind person who sat in his office after meeting with us and researched the best doctors in Northern California for oncological orthopedics. He located a specialist at UCSF in San Francisco and called her. Because he was a colleague, she accepted his call. She told him that if I could get to UCSF that night, she would operate on me immediately. I was placed into an ambulance and driven to UCSF. My wife was there and sat with me in my room as I awaited surgery. Finally, at around 11 PM on Sunday night I had my hip replaced. As I recovered in my hospital bed, Deborah stayed by my side as much as she could. However, we lived in Petaluma, over an hour away. Deborah was being pulled in multiple directions, trying to keep her own business going so that she could keep our family afloat while also attending to me. She was getting barraged by calls from doctor’s offices, medical facilities, pharmacies, and others. She talked to the insurance company for hours, getting them to cover as many bills as possible. She worked at her business until late at night every day. It was a courageous effort on her part, but she simply couldn’t hold everything together. She began to lose business and clients. All this was happening during the devastating Paradise fires in California. The local air had turned a tobacco brown which persisted for days on end. Deborah has asthma, so she would come to see me in the hospital wearing a face mask to protect herself. And then she would have to drive all the way home in the toxic air. Deborah arranged for me to recover further in a local rehabilitation facility in Petaluma. She had me transferred from San Francisco via an ambulance. The Petaluma facility placed me in a space next to a man with a bad cough, and I could hear people coughing and sneezing throughout the facility all around me. I was in an open area. Deborah went to the manager and “explained” to him that I was a cancer patient on chemotherapy medications recovering from surgery. My immune system was compromised and I could not be exposed to sick people. Within minutes I was transferred to a private room where I remained for the duration of my stay. Deborah came over constantly to check in on me. Despite her courage, her spirit, and her love, I could see that she was being completely worn out. As we held hands in my room, I told her how much I loved her and that I was overwhelmed by how much she was sacrificing to take care of me. She said that she would never stop, that she would stand by me no matter what was to happen. I quietly cried in my room when she was gone and nobody could hear me. I had never experienced such unyielding unconditional love. I couldn’t bear the thought of leaving her and our daughter behind. I resolved to get much tougher and stronger myself, to take complete responsibility for my experiences, to give it everything I had in me. I realized that love in a relationship is not granted to everybody because it isn’t a given in this world. You have to make it more real every single day. While both of you are responsible for the relationship, it’s up to you to step it up on your own side. Even when your body is failing you. Even when you have cancer. You have an angel behind your eyes? Oh, and I love her! God knows that I love her! I would throw myself at her feet and swear that I am unworthy! In the present, I’m back home and have been stable. I’m very grateful to the doctors at UCSF who have provided me a team beyond compare. They have put me back on my feet and given me hope that I can continue for possibly even a few more years. But the real subject of this story is my beautiful wife, Deborah Price. The patient tends to get most of the attention from others, but the caregiver is the strong one behind the scenes. Deborah has had to handle test after test with grit, courage, patience, and perseverance. She has literally saved my life more than once. And, she has also had to help me directly, putting on my socks, telling me she loves me, and encouraging me to remain hopeful.